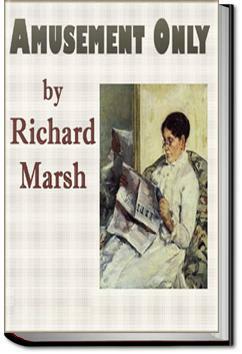 This is a collection of 12 short stories of mystery and humor, which are, as the title says, for amusement only. . . .e chaplain to let his charges see that he was at least acquainted with their phraseology. But on this occasion there was no response. The officer in charge of Mankell, who possibly wanted his dinner, put in his oar. "Telling fortunes! Oh! Dear me! How sad! You see what telling fortunes brings you to? There will be no difficulty in telling your fortune if you don't take care. I will see you to-morrow morning after chapel." The chaplain turned away. But his prediction proved to be as false as Mankell's were stated to have been. He did not see him the next morning after chapel, and that for the sufficient reason that on the following morning there was no chapel. And the reasons why there was no chapel were very curious indeed--unprecedented, in fact.